The 12 young soccer players and their coach rescued from a Thai cave never gave up hope of being found alive and passed the time digging into a rocky wall believing they might be able to tunnel out, they said Wednesday. 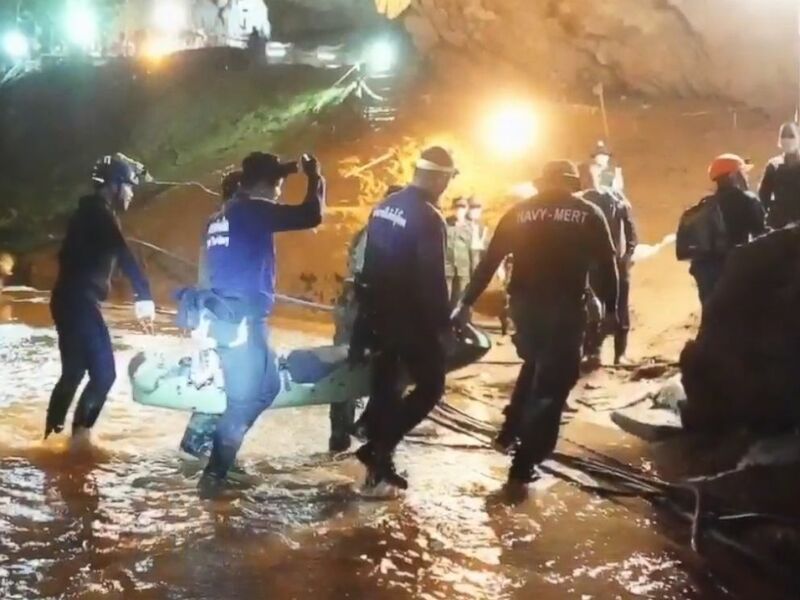 In their first public appearance since the improbable rescues ended eight days ago, the members of the Wild Boar soccer team detailed their harrowing 18-day misadventure after they entered the Tham Luang Nang Non cave in northern Thailand June 23. The group set out on the excursion planning to explore the subterranean maze only for an hour, they said, explaining that some of them had activities to attend that afternoon and one was expected at his 16th birthday party at home. While they had preplanned the trip, communicating on Facebook, they brought no food and or drinking water. "It was on the way back … when we got trapped," Ekapol Chanthawong, an assistant coach who led the boys on the ill-fated trek, said in Thai Wednesday at a news conference in Chiang Rai, Thailand. They quickly learned their path out was blocked by floodwaters, Chanthawong, 25, said. They realized they'd have to wade or swim through the water to escape. As the water in the cave rose, they were forced to retreat and regroup. The boys began to fear they were lost. "I told everyone to fight and not be defeated," Chanthawong said. As the hours passed and the cave grew pitch black, they said, the group used a flashlight to guide them deeper into the dank underground. They conceded that they would have to spend the night in the cave and searched for a place to shelter. 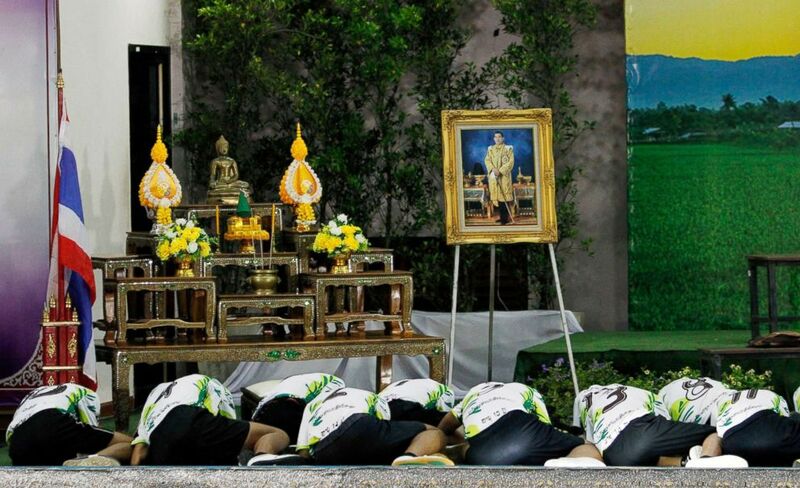 Thirteen rescued members of Wild Boar soccer team pay respects to a portrait of Thai King Maha Vajiralongkorn Bodindradebayavarangkun atthe Chiang Rai Provincial Administrative Organization in Chiang Rai, Thailand, July 18, 2018. Many in the group began to feel thirsty and hungry, they said, with the group stumbling across freshwater trickling down the side of a cave wall about 650 feet up a rock. They decided it was the best place for them to bed down on the hard ground for the night. The group prayed before going to sleep, they said. "I didn't worry at the time because I thought the water would lower down overnight and we would get out," Chanthawong said. But when morning came, conditions had worsened in the cave, they said. Despite the hunger, Chanin Vibulrungruang, 11, said he tried not to think of food, filling his stomach with the water trickling down the cave wall. As days slipped by, they spent the time digging into the wall, believing they might be able to tunnel out. Another boy said they began digging in shifts. "We could not go out but what we could do is dig at the cave wall because at least we could do something," the boy said. "We took turns along the way." By the fifth day, coach Chathawong realized the boys were getting weak and told them to limit their movements to conserve energy, he said. They discussed moving further into the cave, thinking there might be an exit at the end of the 6-mile-long grotto. That’s when they heard the water rising toward them. "So we had to walk," Chathawong said. "The water rose three meters," or nearly 10 feet. They eventually found high ground on a beach inside a chamber that became known as "Chamber 9." They lost track of how many days they had been lost. They were sitting inside the chamber one evening, "playing with a rock," when their prayers were answered, Adul Sam-on, 14, said. "Suddenly, we heard somebody talking," the teen said. The group grew silent and listened. At first, they thought they were hallucinating. Panumas "Mig" Sangdee, 13, had a flashlight in his hand but he was too scared to go and investigate the source of the voices, Adul said. "I took the flashlight from him and went down right away," Adul said. "I said, 'Hello' or something like that. They didn't show their faces at first. They stuck their faces up and were talking." Two divers from the British Cave Rescue Council, John Volanthen and Richard Stanton, were stringing a safety rope through a flooded area of the cave when they popped up in a cavern and, to their surprise, saw all 12 boys and their coach huddled on a small beach in the darkness. "It was like a miracle," Adul said of the encounter 10 days after they went missing. "He [Volanthen] asked me a question. It took a long time to respond to it." A video of the moment was released by the Thai Navy SEALS. In the footage, Volanthen asked Adul how he was and how many were in his group. "I said, 'We have thirteen,'" Adul said. "Then he said, 'Brilliant.’"